US$ 1660 / person ? 1 Arrival, drive to Thimphu Arrival by plane to Paro airport and drive to Thimphu or in case of arrival by land, crossing border from India in Phuntsholing/Jaigon and full day drive to See Memorial Chorten, always busy with devotees. Other sightseeing subject to arrival time. 2 Thimphu Early morning drive to Buddha Dordenma, the gigantic statue of Buddha overlooking the valley and walk to striking city viewpoint. Walk in Norzin lam street and see the traffic police signaling in junctions. Thimphu is only capital in the world without the traffic lights. Finish walk at handicraft market where many interesting Bhutanese souvenirs can be seen and bought for reasonable price. Continue with visit to Folk Heritage Museum with the exhibition on traditional village life in Bhutan (closed on Sunday, alternatively visit Simply Bhutan museum). Visit hand paper factory and Thangkha painting center, where young artists learns the skills of their forefathers. Then drive to Changankha lhakhang, the oldest place of worship in the valley. Alternatively cut previous program short and explore the Thimphu town on your own. Evening visit of Tashichho dzong, the castle, which serves as seat of the king and government. 3 Thimphu – Gangtey Transfer to Wangdue Phrodang over Dochu-la pass (3010 m) with visit of royal temple Druk Wangyel lhakhang. Descend to tropical valley of Punatsang chu river. Soon after lunch you will start driving up to the mountains until you reach pristine Phobjika valley (2750 m). Visit of historical Gangtey Gompa. 4 Gangtey – Trongsa Early morning 2½ hour walking tour through the valley is one of the most beautiful and easy hikes in Bhutan. You will go through the buckwheat and potato fields to the mixed forest with trees decorated with old men's beard lichen and finally you will get a view of marshland. Here, in late autumn and winter, rare black neck crane can be seen. Finish hike and drive over the Pele-la pass (3500 m) to Trongsa with lunch near picturesque village Rukubji. After reaching Trongsa you'll visit intricate museum in the watchtower called Ta Dzong. It hosts number of interesting artifacts related to royal dynasty, history of Bhutan and many religious statues. You will also see great Trongsa Dzong, the castle from which the royal dynasty of Bhutan had risen. 5 Trongsa – Gelephu Early morning we start drive to Gelephu, the major south-central town bordering with India. Total distance is 275 km which will take about 7 hours to cover. On the way, we will visit Green tea gardne, some 1.5 hour drive after Trongsa. Very good quality green tea is produced here, although just hundreds of kilograms a year. Also we will stop at Kuenga Rabten, the third king's palace. In the vicinity it's also possible to visit Karma Drubdey Nunnery. Some 20 minutes further drive down, there is Eundu Choling, another old royal palace with display of antique armoury and musical instruments. Continuing further south, you can make several stops to enjoy the changing nature. Surrounding forests and mountain slopes, especially around Tingtibi, are a are very popular for birdwatching. Reach to Gelephu in the evening. 6 Gelephu – Sarpang – Damphu (Tsirang) Pay a visit to Nyimalung Tratsang monastery. If permitted, we can also visit distillery which produces ubiquitous Bhutan Highland Whisky and other great spirits. Then we undertake approximately 1 hour drive to Sarpang, the district headquarters. This is one of the old and important towns in southern Bhutan. We will visit Zangto Pelri temple built by Ap Dorji Wangdi in 1975. It servers as winter residence of famous Bhumthang's Tharpaling monastery. Also we will see Sarpang school, which is one of the oldest in central Bhutan. Many of the country leaders studied there. Later we will take 2 hours drive to Damphu (Tsirang town) enjoying the beauties of southern foothills on the way. If time permits, we can also visit to some of the villages, which belongs to various ethnic groups and castes of Nepali origin. These people, called generally Lhotshapmas, started settling in southern Bhutan at the end of 19th century. Reclaiming it's fertile land, they vastly contributed to emergence of present day Bhutan. 7 Damphu (Tsirang) – Wangdue / Punakha Morning stroll in the sleepy town, botanical park and nearby joint Hindu-Buddhist temple, the unique feature symbolizing unity of local Buddhist and Hindu communities. Then pass around the Tsirang dzong, newly but traditional built administration centre and hike slightly up above the town. 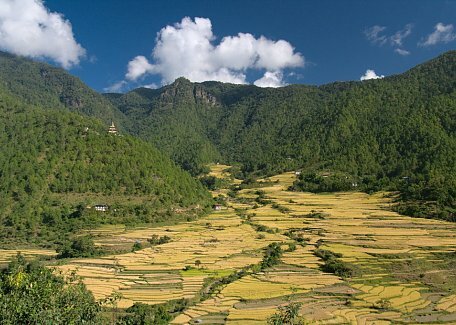 Continue with 8km / 2.5 hours long hike passing through the paddy fields, forrest and around the village houses with many beautiful views of the rich Tsirang nature. Finally reach to Tsolingkhar temple in which along with the statues of the buddist saints you can also see corner dedicated to Hindu deities. Finally descend to the road in lower Tsolingkhar where the car will be waiting. After lunch you will set to drive to Wangdue, taking longer diversion route through Tsirang Toe. On the way stop at Singa Devi Temple, one of the few authentic Hindu shrines in Bhutan. When reaching Tsirang Toe, you will walk above the central school to see picturesque ruins of large dzong (castle) which is said to be over 200 years old. Castle belonged to local warlord Sang Sup Gyap, who was deposed from power by Jigme Namgyel, the father of first king of Bhutan. If you feel like to do some extra walking, you can hike from here through the vital forest to the scenic viewpoint called locally Goemba. Then continue drive , partly by the rough road, finally reaching the main highway by the Sankosh river. Stop here to shop for local products, especially tasty homemade pickles, famous Tsirang oranges, honey and others. Finally reach to Wangdue / Punakha in the evening and get rest. 8 Wangdue / Punakha – Paro Early morning hike to Khamsum Yulley Namgyal Chorten with wonderful view of the valley and it‘s terraced paddy fields. See the longest suspension bridge in Bhutan stretching the length of 350m over Pho Chhu river. Visit of Punakha dzong, which counts as the most intricately decorated castle in the kingdom. Short walk to Chhimmy lhakhang temple, devoted to 15th century saint Drukpa Kunley, know as “Divine madman”, who did taught Buddhism by singing, drinking and rampant sexual behavior. If time permits, also visit Sangchhen Dorji Lhuendrup Lhakhang nunnery with Bhutanese and Nepali style stupa, overlooking the valley from the high hill. Evening drive to Paro. 9 Paro Morning visit of Kyichu lhakhang, the temple built in 8th century by Tibetan king Songtsen Gampo. Climb to Taktsang gompa (Tiger's Nest), most venerated and holy place in Bhutan, overlooking valley from the steep cliff. Afternoon visit of National Museum and Paro dzong, castle where Bernardo Bertolucci’s Little Buddha film was shot. 10 Departure Depart from Paro airport by flight or drive to land border in Phuntsholing. Bumthang extension (+2 or +3 nights): In case you want to visit central Bhutan, you can continue from Trongsa to Jakar on day 5 and spent two or three night in this spiritually loaded valley. After that, you will turn back to west and reach Gelephu via Trongsa. Finish tour in Gelephu (-4 days): In case you don't want to get back to Paro, you can also finish the tour in Gelephu. From there you can either go to Guwahati or Bagdogra in India. Dagana excursion (+1 day): If you stay one more night in Damphu, you can make full day excurion to Dagana, formerly one of the most prosperous districts of Bhutan. Apart from beautiful hill nature, there is large and interesting castle to see. Really few tourists visit this place.